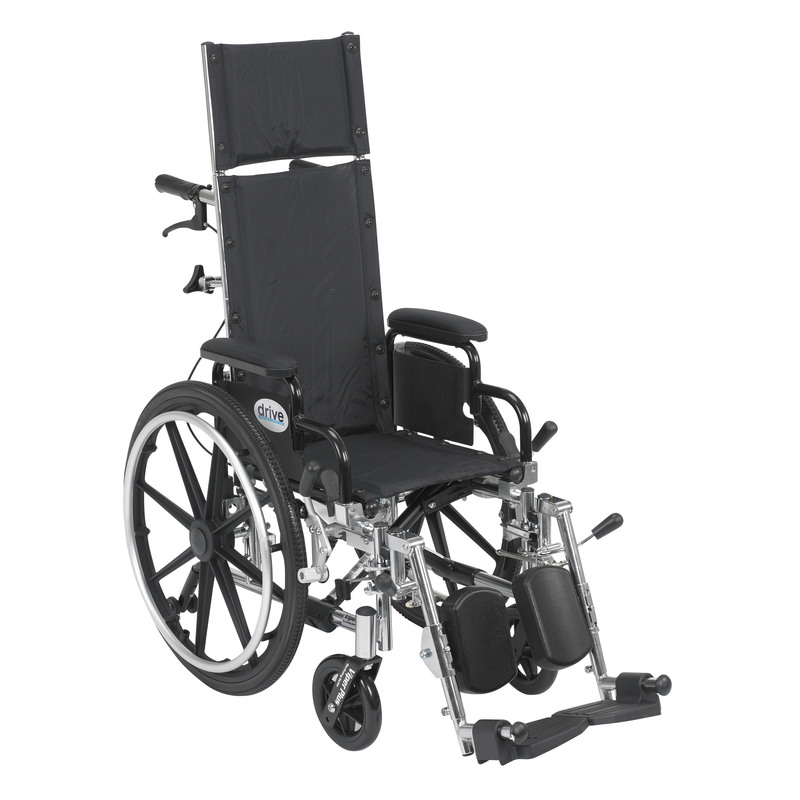 Viper Plus Light Weight Reclining Wheelchair with Elevating Leg rest and Flip Back Detachable Arms | Mountain Aire Medical Supply, Inc.
Don't let mobility challenges keep you from getting out and experiencing all life has to offer. For many people, a manual wheelchair is the ideal solution to maintaining mobility independence. Manual wheelchairs are among the most commonly used mobility devices thanks to their versatility, functionality, ease of transport and low maintenance. The pediatric version of the Viper Plus from Drive Medical offers all these features and more. The Viper Plus offers a state-of-the art hydraulic reclining mechanism which allows the backrest to recline from 90 deg to 180 deg. 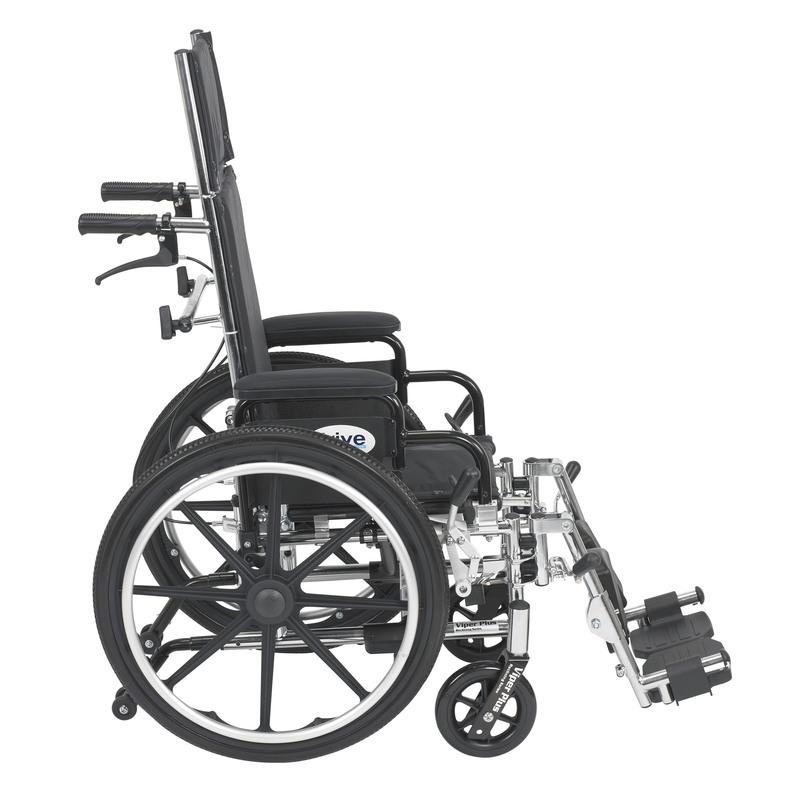 The special offset rear wheels ensure stability and evenly distribute the user's weight in all reclined positions. It features a carbon steel frame that is double coated with chrome and is available in 12" and 14" seat widths, perfect for younger users. The frame is durable, strong and chip-proof and the upholstery is a heavy gauge black nylon for long-lasting comfort. The chair features flip-back desk length arms. Swing-away elevating legrests with composite footplates that are durable and lightweight are also standard. The front caster forks are adjustable in three positions and the casters and rear tires are constructed of a lightweight urethane for a smooth ride. The Viper Plus also has standard dual axles that provide an easy transition from seat to hemi-height for self propelling. Seat to Floor Height: 15"-16"